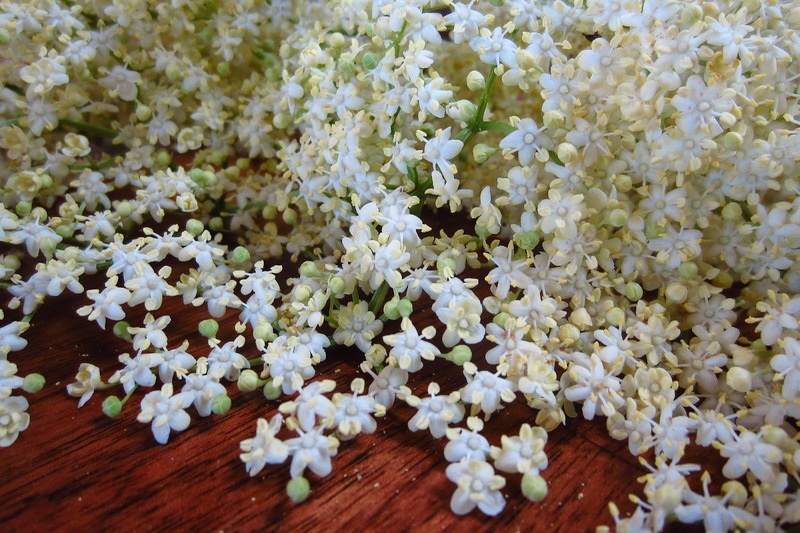 Elderflowers are magical things; they sit in big clusters of tiny cream-colored blossoms that light up an otherwise unassuming bush. When you walk by on a warm day or after a rain, their fragrance can make your head swim – it’s addictive. Like a bee you want to stick your nose in and have more. The flowers manage to smell both sweet and earthy and light and fresh at the same time – maybe that’s their secret. 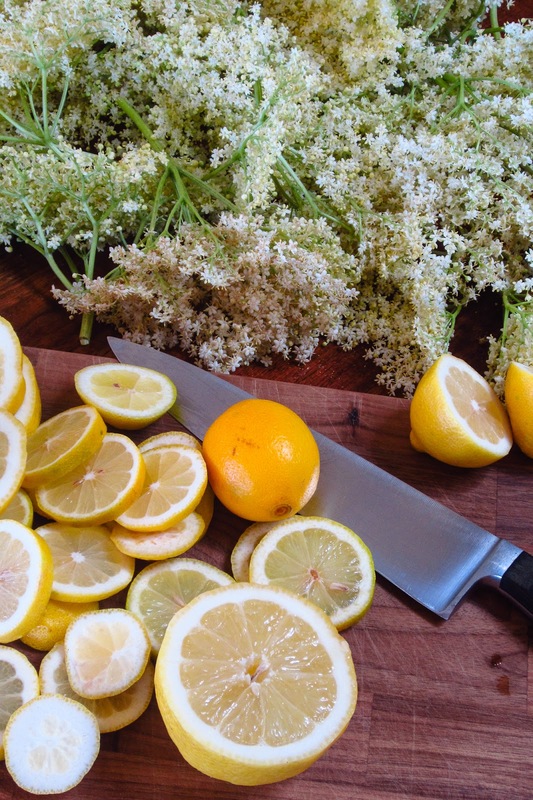 Since they grow like weed in these parts, there’s lots of them – a good thing, because drinking elderflower juice or soda is the non-alcoholic default choice for adults and a favorite for kids. It’s always available, no matter the establishment, whether it’s a fine dining spot or a casual beer place – some even brew their own. 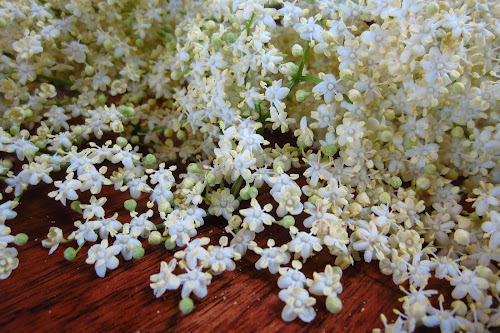 In our house (like in many others, I’m sure) we make our own elderflower syrup, to be mixed later with water and crushed ice and jazzed up with a slice of lime or two. The syrup goes into smoothies and deserts or into popsicle mix and some of it gets prime real estate in the freezer for those times when you need a ray of sunshine in your life and there’s non to be had outside. The garden variety elderflower bush (sambucus) can be found everywhere, but if your lucky enough to have a garden with a pink elderflower bush (sambucus nigra) in it, go for it – you’ll get lovely pink colored juice from its flowers. 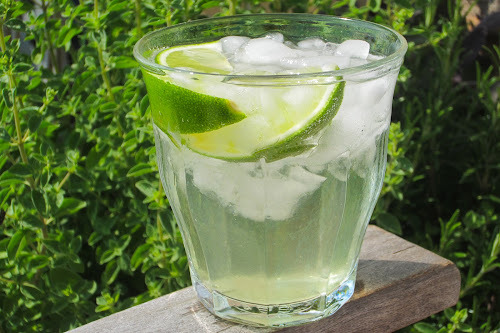 A note on freezing elderflower syrup: don’t have the same smart idea that I had a couple of years ago and fill the syrup into ice-cube freezer bags for easy portion size removal (…sounds smart so far, right?) and put them on the top shelf of your freezer – unless you feel like investing a couple hours of your spare time cleaning up the mess you’ll invariably make: the bags burst. 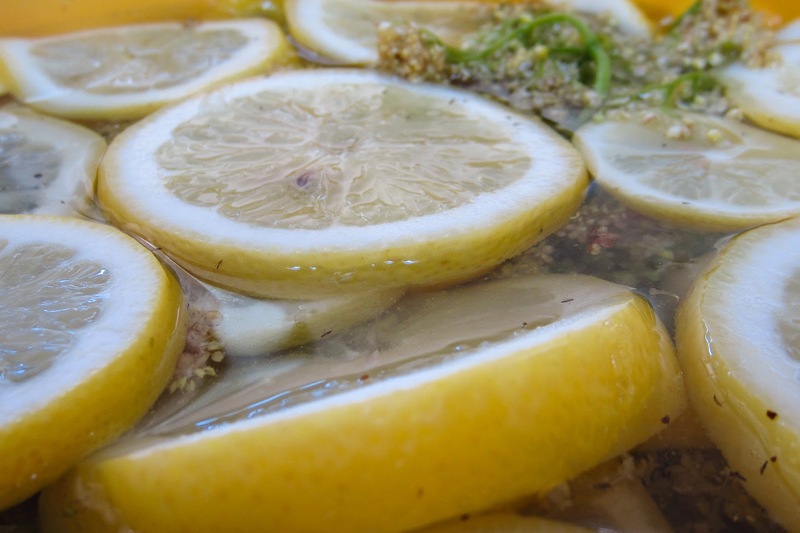 The material is too thin and no match for the high acidity of the syrup and all the gooey elderflower goodness will run out and coat the back (…and the sides and the drawers, too…) of your freezer, which won’t improve your mood at all, I promise. 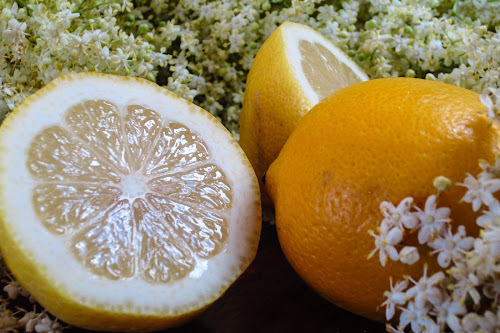 When you go pick your elderflowers try not to shake them too much, so you won’t dust yourself in yellow pollen and loose the tasty stuff in the process. Don’t wash the flowers, either, just make sure there’s nobody living in them anymore before you put them into the bowl. 1. Put the sugar and citric acid in a bowl large enough to hold all ingredients. 2. Remove any really long stems from the flowers and put in the bowl. 3. Slice the lemons and put on top. Pour over the hot water and stir gently to help the sugar dissolve. Let cool to room temperature, cover and place in the fridge for at least 3 days. 4. Pour the syrup through a sieve and squeeze the last bit of flavor out of the lemons and flowers. Strain again to catch any seeds or flower petals that escaped earlier. 5. Mix to taste with water or sparkling water (or champagne, if there’s a good reason) and serve over ice. Note: the syrup will keep in the fridge for two weeks, or in heavy duty freezer bags in the freezer for ever – I hoarded last years’ last batch until April this year and used it as a mood enhancer when spring just wouldn’t spring..